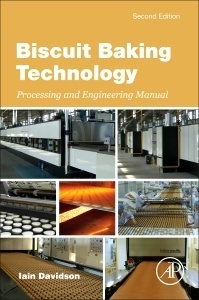 Biscuit Baking Technology, Second Edition, is a reference book for senior managers and staff involved in industrial scale biscuit baking. It covers the biscuit industry process, ingredients, formulations, besides design, manufacture, installation, operation and maintenance of the baking ovens. Written by an expert on the biscuit baking industry, the book is a complete manual guide that will help engineering, production and purchasing managers and staff in the biscuit industry to make the best decisions on oven efficiency purchasing. Iain Davidson graduated from the School of Industrial Design (Engineering) at Royal College of Art in London in 1965 and joined Baker Perkins Ltd. He was Industrial Design Engineer, working in the Technical Department on the design of new biscuit, bakery and candy processing machines until 1975, gaining a thorough technical knowledge of the machines and processes. Iain was responsible for a substantial increase in the company’s biscuit business in Asia During this period the company’s Asian biscuit machinery business grew by over 3 times. Iain established a successful manufacturing facility for biscuit ovens in Dalian, China in 1990 for Baker Perkins and subsequently continued an manufacturing capability for Baker Pacific Ltd. In China, India and Indonesia.